I’ve been a little MIA lately due to a behind-the-scenes makeover here at Zestful Kitchen. This makeover has had me looking back at the last few years of ZK recipes and blog posts. As I’ve been working my way through the recipes, I found this White Wine Spritzer that I developed for the spring 2015 issue of Revival Magazine. (So if you’re still in need of a celebratory drink for this evening, you’ve come to the right place!) Perfect timing, eh? Not only festive, this White Wine Spritzer is also low in calories, so you can start off the year sticking to your resolution. With just a few ingredients needed, this is the best no-stress drink to serve guests. Cheers to the new year, makeovers, sticking to resolutions, and eating wholesome, healthy foods! 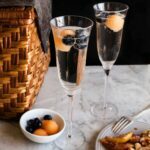 Pour 3 ounces of wine into each champagne glass, top each with 1 ounce club soda and a few dashes of bitters. Drop in a few melon balls and blueberries for garnish.